Iceland's talks with Britain and the Netherlands over repayment of 3.8bn euros (£3.4bn) of debt have broken up without agreement. It means Iceland's referendum on an existing repayment plan looks set to go ahead on Saturday as planned. The ending of talks came as Iceland's Prime Minister demanded Britain apologise for its role in the affair. Icelanders are likely to cast a heavy "no" vote, raising further questions about the country's financial future. 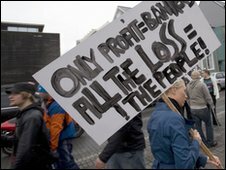 The Icelandic government had hoped to avoid Saturday's referendum by agreeing a new repayment plan before the weekend. Talks between the three countries are expected to continue next week, but not before Icelanders have had their say. A no vote could jeopardise billions of dollars of loans from the International Monetary Fund and other countries. And it could deal a further blow to Iceland's shaky coalition government. Britain and the Netherlands want the money as repayment for bailing out depositors in the Icesave online bank, which folded in 2008 under the global financial meltdown. But Icelanders feel the repayment terms of the existing deal are too onerous and should be rejected because they are being penalised for the mistakes of the banking industry. But there is also hostility against Britain for using anti-terrorist legislation to freeze Icesave assets in the UK. Iceland's Prime Minister, Johanna Sigurdardottir, told the BBC that Britain should officially apologise for its actions. She said Britain and the Netherlands had treated Iceland unfairly. Opinion polls suggest more 75% of Icelanders will vote no on Saturday. The hugely unpopular repayment plan was approved by the Reykjavik government last December. But the plan was blocked by Iceland's President, President Olaf Ragnar Grimsson , in January, sparking the referendum. Despite months of talks between the three countries, negotiations are again deadlocked. A statement on Friday from Iceland's finance ministry said: "The Icelandic negotiations committee returns today from London. Iceland remains committed to a continued dialogue and is hopeful that discussions will resume as early as next week. "Discussions to date have been constructive and Iceland is confident that a mutually acceptable solution can be reached," the ministry said. The stakes are high, because Iceland needs international loans to help it rebuild its economy, which was hit particularly hard during the global downturn. Some of these loans are conditional on Iceland repaying its international debts. The dispute has also overshadowed Iceland's application to join the European Union, which was submitted in July last year. Meanwhile, Iceland's economy grew by 3.3% in the last quarter of 2009, although it contracted by 6.5% over the whole of last year, official data has shown. It was the economy's best quarterly performance since the autumn of 2008. The growth seen in the fourth quarter was in stark contrast to the 7.2% contraction experienced in the third quarter. It was the highest growth since the 3.8% expansion seen in the third quarter of 2008, just before the country's banking system crashed and the government took control of all three of its major banks. "That's a nice number, but it's not springtime yet," said Antje Praefcke, analyst at Commerzbank. "Maybe there's less snowfall, but it's not spring yet." He added that the referendum now risked "a delay to the economic recovery". The 6.5% annual decline in gross domestic product compared with growth of 1% in 2008 and a 6% expansion in 2007. The decline was due to a 20% drop in domestic expenditure, Statistics Iceland said. Imports decreased by 24%, while exports grew by 6.2%.